WASHINGTON (CNS) — Coming to the Diocese of Cleveland to lead a flock of 677,000 Catholics is “super exciting” for Bishop Nelson J. Perez. As he was introduced to diocesan staff and the media at the Cathedral of St. John the Evangelist July 11, Bishop Perez said he wanted to follow in the footsteps of Pope Francis and develop a church of missionary disciples. “Are you kidding?” he responded to a question asking if he was excited about his new position. “When I saw that (the size of the diocese), that is amazing. There’s a lot of work to be done. I hope that each of these 670,000 Catholics will become missionary disciples, a missionary church, a church that is on the way, a church that is on mission,” he said. Bishop Perez cited five aspects of the church that Pope Francis continues to cite in describing his vision for the Catholic Church: pro-active, involved in the life of people, accompaniment, fruitful and joyful. He said he wants to help build a church the pope envisions. “I hope that these 670,000 missionary disciples will go out, each one of them, and call more people to get to know Jesus Christ and love the church. Those 670,000 people that make up this local church, our church, my church, is all potential. And we have to be joyful and excited and enthusiastic about that,” Bishop Perez said. He also said he wanted to immediately start on the mission, but that his installation Sept. 5 as the 11th bishop of Cleveland was still about two months off. The new diocesan leader also called on Catholics to introduce themselves whenever they see him exploring the diocese. He said he looked forward to visiting the Rock and Roll Hall of Fame, located on the Cleveland lakefront a few blocks from the cathedral. Becoming bishop of Cleveland was a surprise to the son of Cuban immigrants, who fled their homeland in 1960, just months before his birth, during a government crackdown on individual freedoms. He said he never imagined coming to Northeast Ohio, with its rich ethnic heritage, to lead the church; nor did he expect to be named auxiliary bishop of the Diocese of Rockville Centre, New York, in 2012. “God’s ways and thoughts are not ours. But I know and trust, his ways are always better and deeper than our own comprehension,” he said. Bishop Perez said his faith and his eventual vocation to the priesthood was nurtured by his parents, who moved from Miami to West New York, New Jersey, when he was young child. “I continue to love and learn from their devotion to the Lord,” he said. He cited that deep practice of the faith in a brief address in Spanish to Northeast Ohio Latino Catholics as well. He recapped his background and his work among Hispanics in the Archdiocese of Philadelphia, where he was assistant director of the Office for Hispanic Catholics, and the Rockville Center Diocese, where he was vicar for Hispanic ministry. 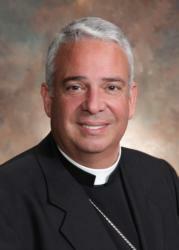 The bishop also is chairman of the U.S. Conference of Catholic Bishops’ Subcommittee on Hispanic Affairs. As a priest in Philadelphia, Bishop Perez was the founding director in 1993 of the archdiocesan Catholic Institute for Evangelization, which focuses on adult faith formation development and lay ministry training. He served with the institute until 2002. He continues to lead retreats, parish missions and days of reflection nationwide. With such a deep interest in evangelization — bringing the good news of Jesus to others — Bishop Perez said he also hoped to engage with key issues affecting the broader community outside of the church. Bishop Perez succeeds Bishop Richard G. Lennon, who retired in December at age 70 citing health reasons. Bishop Daniel E. Thomas of Toledo, Ohio, has served as apostolic administrator since the retirement.